Yes, this is all genealogy all the time. Deal! Right now, I share with you something that occurred since about 10:30 last night. It is 12:07 a.m. right now. This is mostly to document how pieces get connected. The story starts with Mary Weiss, my 2nd great aunt. According to the inscription in 2010 Quotations of Emo, she died June 21st, 1898 in Denver Colorado. That’s a long way from Cassville, Wisconsin. Because the 1890 census was destroyed in a fire, I have no easy to find records of her between 1880, when she was 11, and her death in 1898. Why did she move to Colorado? Teaching? Nursing? Was she running a hardware store like her brothers? The Colorado State Archives has an online index of documents, and one of them was the death record for a Mary Weiss in June of 1898, which meant it was pretty likely the same Mary Ryan. The document itself is available for purchase. However, they want $25 for a copy of it, so I put off buying it. Last week I bought it for myself as a birthday present, and it arrived today. No scan of it yet. But really, it’s pretty minimal, and it doesn’t even look like the original document. More like a transcription that was typed out. Mainly it is independent confirmation of the information inscribed in 2010 Quotations of Emo. Otherwise, it didn’t give me much additional information of the useful variety. She died in St. Anthony’s Hospital, where a cursory search of the internet did not reveal it’s history. This confirms her status as single, which was easy to guess since she still had the Weiss surname. The cause of death is listed as pulmonary tuberculosis. Which made me think perhaps St. Anthony’s was a famous sanatorium at the time and she was shipped there by her parents as a chance for her to get better. No idea as yet. It has a line for Dr. , which is listed as J.N. Hall, and the undertaker as Waters and Simpson. None of that will be useful in tracking her down except that she died in St. Anthony’s. So I started searching. The Google search didn’t have anything. So I jumped on NewspaperArchive.com, which has an extensive inventory of Madison newspapers, but previously only had a paper from Colorado Springs from that state. Still the case. But for some reason, this time I Googled Colorado newspaper archives perhaps hoping to find something I could eventually visit and dig through microfilm. But on the first page was the Colorado Historical Newspaper Archive. Holy crap! Why didn’t I know that was around? So I searched for Weiss in 1898 in Denver, but found nothing relevant. Some perusing around seems to indicate they have no digitized newspapers from that year for Denver. Damn. On a whim, before I closed my laptop for the evening, I search for Nat Leonard . That’s the son-in-law of my another 2nd great aunt, Julia Ryan Dolphin. Julia Ryan married Harry Dolphin and moved to Colorado from Glen Haven with her sister Laura Ryan and daughter from her first marriage to William Grimm. They are buried in the main city cemetery in Colorado Springs. Her daughter Kathleen married Nat Leonard, who was a boxer and later ran tour companies. But I hadn’t been able to track down who Nat’s parents or other immediate family. I have a couple of clues from their graves, but I hadn’t pursued them yet. 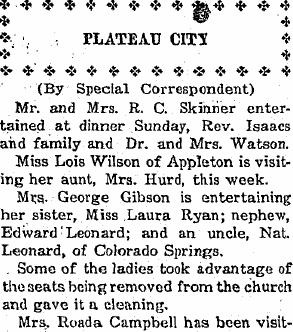 Mrs. George Gibson is entertaining her sister, Miss Laura Ryan; nephew, Edward Leonard; and an uncle, Nat Leonard, of Colorado Springs. I immediately said (out loud even), Holy crap! Laura Ryan had 4 sisters: Frances Ryan Weiss (my great grandmother), Alice Ryan (who lived in Beetown, Wisconsin), Julia Ryan Dolphin, and Mary D. Ryan. The last had disappeared after the 1900 census. I’ve been trying to find her for 8 months! She has to be Mrs. George Gibson! Not necessarily. I know she doesn’t have a nephew named Edward Leonard (grand-nephew though), and Nat Leonard himself would be a nephew, not an uncle. So if those are wrong, its possible the sister designation is wrong too. But I think it is her. Plugging her husband into the Ancestry.com search engine finds him in Collbran, Colorado in 1910, 1920, and 1930. All with a wife named Mary listed as being born in Wisconsin around 1868. Which matches what I know about Mary Ryan. So I did a search on Find a Grave, to see if I could find her burial site. Bingo! 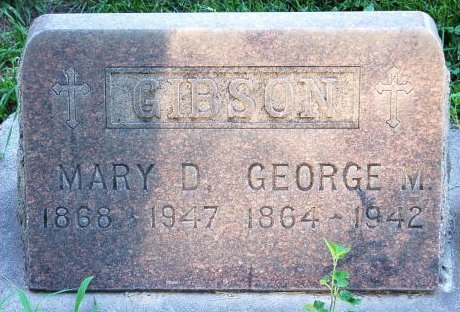 There’s a George and Mary Gibson buried in Calvary Cemetery in Orchard Mesa, Colorado, not far from Collbran and Plateau City. And now that I have an online source for Colorado newspapers, I have a lot of digging to do. That is exciting! What good luck!